I read about this on several blogs and saw it on Facebook a couple times before I decided to try it. Honestly, it was SUPER easy...as long as you 1)kept an eye on them, 2) could tell when they were done. You simply take the cinnamon roll from the tube, place it on the waffle maker, close it, and let it cook. When they are done, you are done...unless you plan to drizzle the yummy icing over them. That. is all there is to them. Easy peasy! You can see the pin on my Pinterest Board (along with many others!). Well, I attempted a few recipes from the Friendship Bread Kitchen website (which I found after reading Friendship Bread by Darien Gee on recommendation of the A Bowl Full of Lemons Book Club). I made the Cornbread recipe. It was good and very easy to make. The bread was a lovely golden color and smelled delicious. 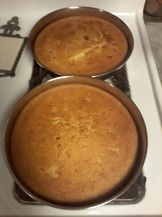 It was moist and not too sweet or to dry, as cornbreads tend to be one or the other. I think I may try to add more sugar next time (since I like my cornbread on the sweet side). I am also thinking about trying it with some creamed corn to give it a more corny flavor and texture.